The scope of delivery comprises six generators (615-990kW); two main propulsion motors (1,000kW); two electric motors for tunnel thrusters (1,200kW); Quadro Drive frequency converters; main switchboard (690V-440V-230V); EMSB (690/230V); transformers; blackout safety system; and remote assistance system. In addition, NES is responsible for engineering and commissioning of the system. The vessel will be built at Astilleros Zamakona Santurce Shipyard in Spain and will be ready for delivery in August 2019. 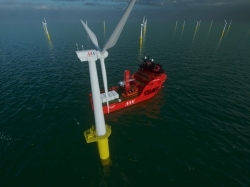 Esvagt has signed a contract with wind-power company MHI Vestas and the ship will operate at the offshore wind farm Deutsche Bucht.